FOUNDED in Sweden in 1988, Husaberg is the story of two engineers whose aim was to create the ultimate offroad motorcycle. The brand grew quickly in popularity and claimed the European Enduro championship in its very first year. This was backed up by twin world enduro championships at the hands of Kent Karlsson and Jaroslav Katrinak in 1991. In 1995 the Swedish brand was acquired by a soon to be Austrian powerhouse going by the name of KTM Sportsmotorcycles. Under the guidance of KTM, the Husaberg brand has grown into what we see today. With a global presence, extensive dealer network support and a complete line up of two and four stroke motorcycles, Husaberg is one of the biggest players in the offroad market. 2014 will be the last time we see a brand new Husberg on our dealer floors however. With the recent acquisition of Husqvarna, KTM has decided to merge the Husaberg and Husqvarna brands together. Before the famous blue and yellow ’Bergs disappear into the past we thought it was only fitting that we throw a leg over two of its most popular machines, the FE 250 and FE 450 four stroke enduro models. Completely revamped for 2014, the FE 250 features an entirely new engine, major chassis modifications and redeveloped WP suspension. The new engine design shares many of the same basic components that are featured on the FE 350, that being the DDS clutch, the engine cases and even some of the drive components. A larger 78mm piston and 2.8mm shorter stroke results in a stronger, more reliable engine with plenty of torque and power. The new chassis and WP suspension are two areas of the bike that have been designed in harmony. The WP 4CS, 4-chamber closed cartridge fork and WP PDS shock are nothing new on the ’Bergs but have undergone extensive development for 2014. The chassis and suspension changes aim to give more feel and traction back to the rider in all conditions. Weight has been shed from some sections of the frame, with thinner walled down–tubes and revised engine mounts added to improve torsional rigidity, which means a more stable overall package. On the track the FE 250 is an absolute scream to ride. It’s nimble, agile and aggressive for an enduro machine and will quickly instil confidence into whoever is twisting the throttle. The small bore Husaberg is responsive down low, and continues on with a nice controllable spread of power until much higher up in the rev range. It is certainly a much more powerful package than some of the more outdated, yet new 250cc four stroke enduro bikes out there. 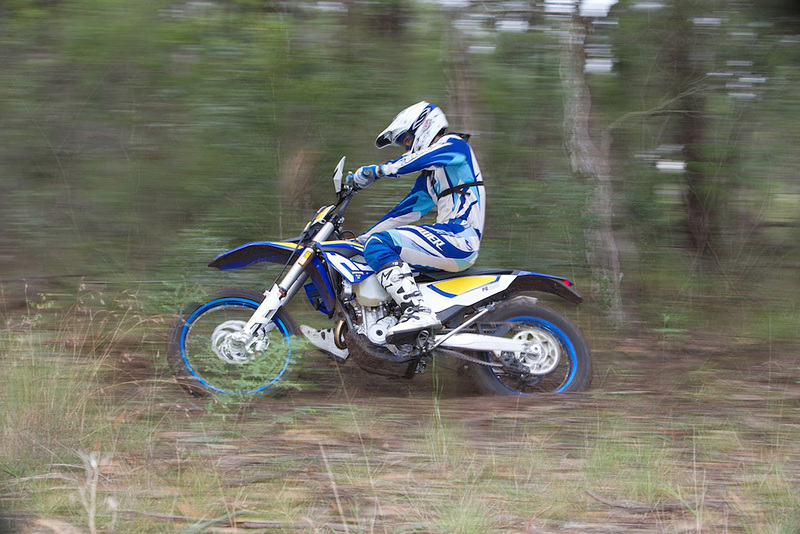 It was hard to fault the handling of the FE 250 on the Cycle Torque enduro special test loop. It turned sharply between the trees and maintained excellent stability when under acceleration and at speed. We slightly adjusted the clickers to slow down the action in the rear end of the Husaberg but other than that we hardly made any changes. The 4CS fork and PDS shock really are tuned to suit FE250. It may remain unchanged from 2013, but the 2014 Husaberg FE 450 is jam packed full of features that won’t leave anyone disappointed. The SOHC engine that powers the big ’Berg was specially developed for enduro use and is shared by the KTM 450 EXC, and is almost the same as what is seen underneath the KTM 500 EXC and Husaberg FE 501. Paired with Keihin Electronic Fuel injection the 450cc Husaberg sets the benchmark for power and rideability in the E2 Enduro Class. 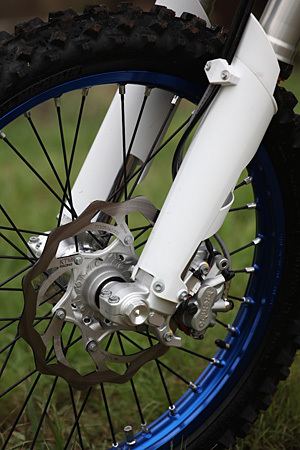 Common across the Husaberg FE models are billet machined aluminium triple clamps housing the WP 4CS forks and a cast aluminium swingarm, which cradles the WP PDS rear shock. The airbox and subframe are produced from a special type of moulded plastic which ensures ultimate strength and durability. 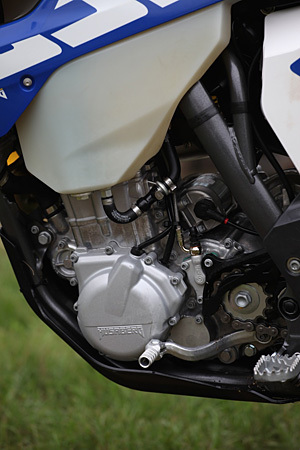 Inside, the airbox is designed with a new fibreglass bracket to provide a more secure fit for the air filter, which is as you would expect from Husaberg, accessible without the use of any tools. Other features that set the Husabergs apart from the rest, are the anodised blue DID rims, which not only look cool but have added strength over most other standard wheel sets. Brembo disc brakes, with an oversize 260mm front rotor come as standard equipment. Oversize tapered handlebars, and a newly developed Trail Tech speedo enhance the cockpit to really set the scene for what is one of the trickest 450cc enduro bikes on the market. Take to the bush and you’ll quickly gel to the FE 450; we were confident and comfortable right from the get go and it took us no time at all to settle in on the E2 class machine. 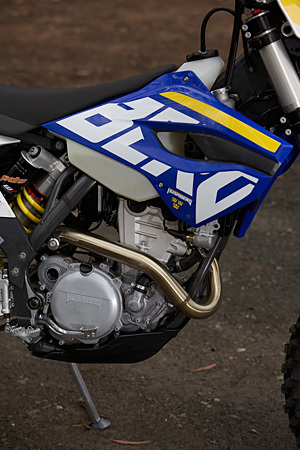 The 450 is a fast bike that offers plenty of torque and power. Most riders will enjoy cruising around and short-shifting the FE through the gears and making the most of its torquey powerband. The FE shines off the bottom and through the mid, and if ridden in this area it will bring a smile to anyone. Further up top the Husaberg doesn’t rev too hard, but an aftermarket pipe and a bigger set of cojones might help fix anyone’s problem if they feel the need for more power. Ducking in and out of ruts and taking on the single trail was easy on the Husaberg, it’s not as nimble as the smaller 250 or 350 but if you take your time you will end up with similar results. Once again the WP suspension is on point with the Husaberg, and will only require minimal changes from most riders. The Brembo brakes on all the Husabergs are a fantastic feature, something that you can quickly take for granted until you throw a leg over a bike with a less than stellar package. 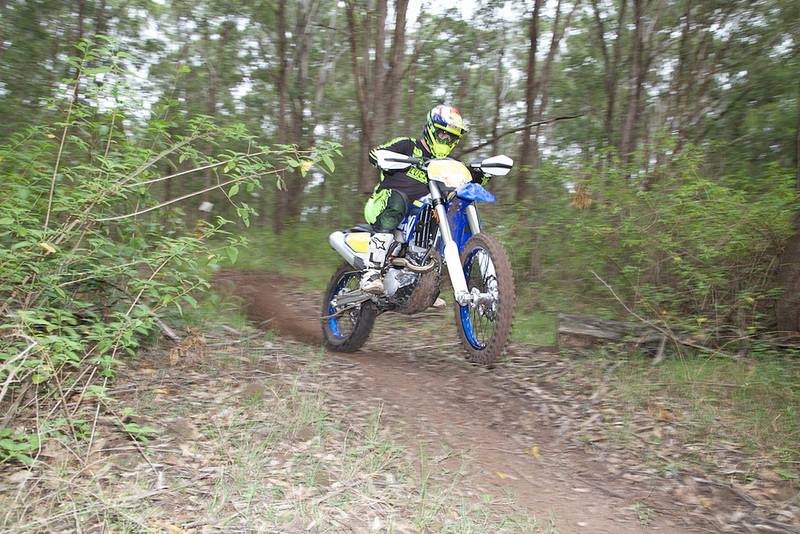 The 450 is a fast, torquey, reliable and steady machine that will certainly please offroad enthusiasts. In standard form, riders can roll this bike out of the dealership and straight into the bush. It requires very little changes to completely personalise the big FE, and most are just adjusting the standard features to suit your needs. If you like going fast on the open fire trails, and enjoy the punchy torquey feel of a big bore thumper then the FE 450 is right up your alley. You will be able to tackle everything you think you’re capable of. The 2014 FE 450 retails for $12,995 + ORC. The 250 is a more aggressively styled off-road machine, its smaller engine requires more work from the rider to keep things humming, yet can be very rewarding when this is combined with the razor sharp handling that the small bore Husaberg offers. 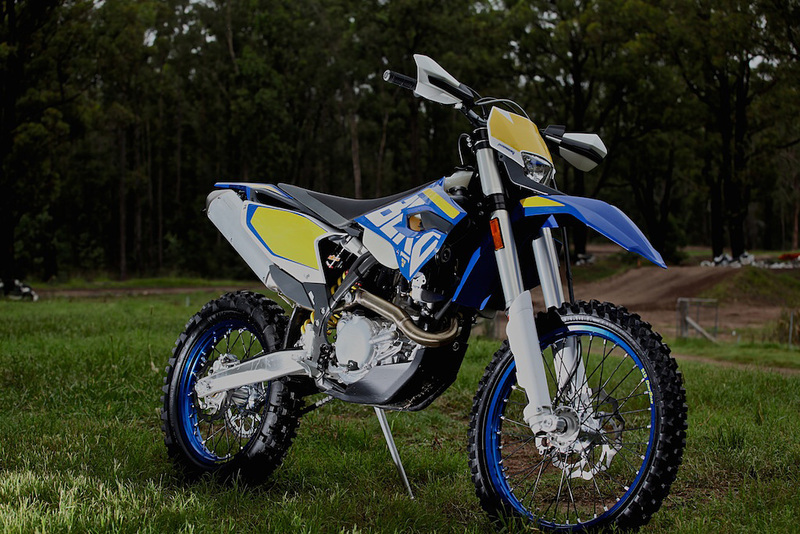 The FE 250 is our pick if we were to have one of these machines in the garage, its lighter more nimble feel works very well on the single trails that we are often blasting around on and with some of our test riders being a bit smaller in size, the small bore 250 is just the ticket. The 2014 FE 250 retails for $12,295 + ORC.